It’s getting near that time of year again…the leaves are changing color, the air is getting crisp*. And the Zombies are starting to come out of the woodwork. And the mall. There are different kinds of Zombies, ya know. In Haiti they are walking corpses, cursed to do the bidding of evil Voo-Doo queens. 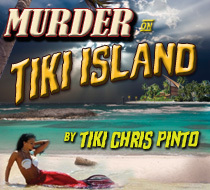 In the South Pacific they’re the soulless cadavers of wicked head hunters, looking for a last meal of brains and coconuts. In New Jersey they run the DMV. In South Florida, they work at Wendy’s and Winn-Dixie. Basically anyone who died and is now walking around is a Zombie. This raises some interesting questions, about accident victims, heart attack survivors, and some famous religious icons. Next time you have dinner with Uncle Harry who made it through his second heart attack, better keep an eye on your brains. Note: Most employees of Atlantic City area newspapers are Zombies. If you’ve gotten this far you probably are already the type who love horrible horror movies. I never saw a Zombie movie I didn’t like. Even the cheesey bad ones are great. Hell, they’re about kats that come back to life after being dead for hours, days & years. The mechanics of it is silly enough…rotted corpses with no muscle left on their little bones would have a hell of a time getting around. Then there’s the whole eating people..especially brains, apparently…thing. Why go after living people who can fight back when there’s plenty of slow-assed Zombies around they can eat? Anyway, Zombieland, the latest installment of blood & guts galore is opening in a few weeks. You can be I’ll be there. Here’s the site with the trailer and some goodies. A couple of other great bad Zombie movies are Slither, Shaun of the Dead, and the old classics Dawn of the Dead and Night of the Living Dead. Oh, and of course the king of all Zombies, Frankenstein. (Does he count? yeah, I think so) If you want more, just go to http://www.geocities.com/shape_of_infinity. This guys had put together a complete list of every Zombie movie ever made. 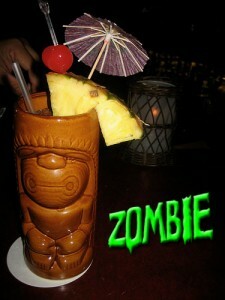 And then of course there’s my FAVORITE kind of Zombie, the one they serve at the Tiki Bar. This concoction of every rum on the shelf plus about 30 other ingredients will certainly make you feel like the walking dead after the first two. Don the Beachcomber invented this one back in the ’30s, and people have been carried out of Tiki Bars on a stretcher ever since. 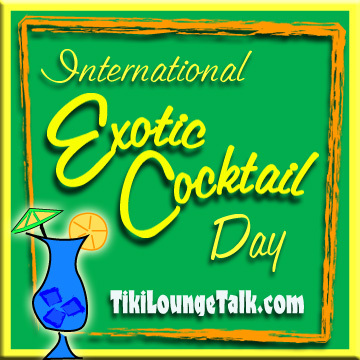 I had one at the Mai Kai in Fort Lauderdale the other night. They’re one of the last places on the planet that still make it right. Their recipe is a secret, but I lay it down for you like this: It’s like drinking Chinese hot mustard with a 151 kick. Some of it spilled on the table and seared a hole right through. But damn, it’s good. Pour all ingredients except the 151 into a cocktail shaker filled with ice. Shake Shake Shake! and strain into a very kool looking Tiki mug over the rocks. Float the 151 on top, garnish with the fruit on a little pirate sword, and add an umbrella. It’s not a Zombie without and umbrella. Extra credit if you have old-fashioned paper straws. Well, that’s about all I have to say about the subject of Zombies. Remember to check your friends and co-workers for the signs of Zombism.If they show any signs, pour them a Zombie. *Technically, no leaves are changing color where I live in South Florida, and the crispest the air gets here in the fall is around 75°. In fact the only way to realize it’s fall is that the traffic gets heavier. 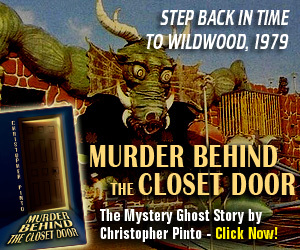 Oh, and about the Voo-Doo Queens and Head Hunters…you realize I have no idea what I’m talking about, right? Good. Now go have a Zombie! My employees are all zombies. I feel your pain.